Release date still to be announced. Following the release of Nekopara Vol. 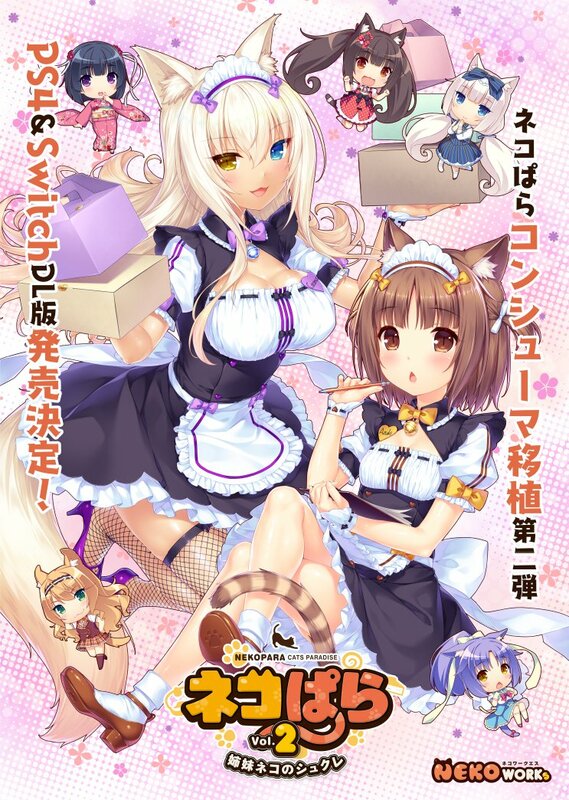 1 on the platforms, Nekopara Vol. 2 is coming to PlayStation 4 and Switch, developer Neko Works announced. A release date was not announced. Business is booming for La Soleil, the patisserie run by Kashou Minaduki with his two catgirls, Chocola and Vanilla, his sister Shigure, and the Minaduki family’s four catgirl sisters. Among them are the sarcastic oldest sister who hides behind a facade of toughness, Azuki, and the clumsy youngest sister who always tries her best even if she ends up doing more harm than good, Coconut. No one got along better than these two catgirls when they were younger, but lately, they’ve been fighting all the time. Despite their sisterly love, a small misunderstanding ends up driving a wedge between them. As the story of these catgirl sisters unfolds, they’ll grow to understand each other and strengthen their familial bonds in this heartfelt catgirl comedy, which is only a little lewd. Now open for business!